Allergies are a perfect example of an ailment where allopathic medicine struggles to find effective solutions, wheras herbal medicine can be very effective. I’m so pleased to introduce this series of treatment strategies from five leading herbalists showcasing the diversity and successes of treating allergies and hayfever with herbs. 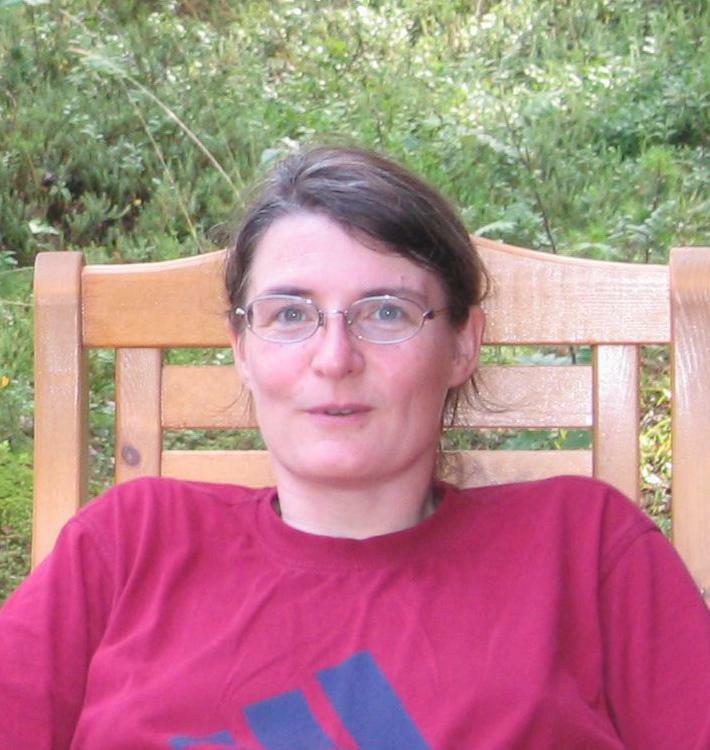 This impressive roster offers a solid and reliable variety of treatment strategies. Bookmark this page because there is A LOT of amazing information here!! 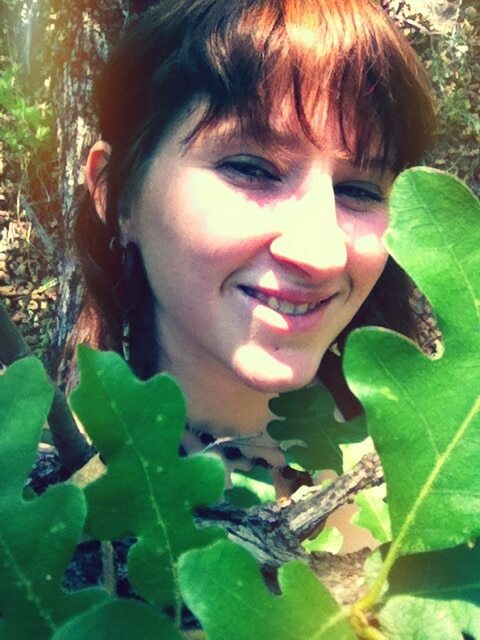 Herbalists are listed alphabetically by first name. The problem with true allergies is, your reaction gets a little worse every time you’re exposed to them. While I have heard stories of people getting rid of their severe fish or peanut allergy, I haven’t had such successes. So if you come to me with a severe nickel allergy, I will tell you to cook your food in enamel or cast iron pans, and to eat it with wooden spoons. I’ll also tell you to wear gloves when you handle money or touch door handles or other nickel-containing metals. And if you tell me that you have a severe reaction to chocolate in all its forms, I will tell you to avoid chocolate – in all its forms. Of course you can strengthen the liver and remove junk foods from your diet, but that won’t really touch true allergies. They are an overreaction of the immune system, in the wrong place. Add various spices to everything you eat. And take bitters (dandelion leaf, gentian, juniper berry, berberis tincture etc.) about 20 minutes before each meal. 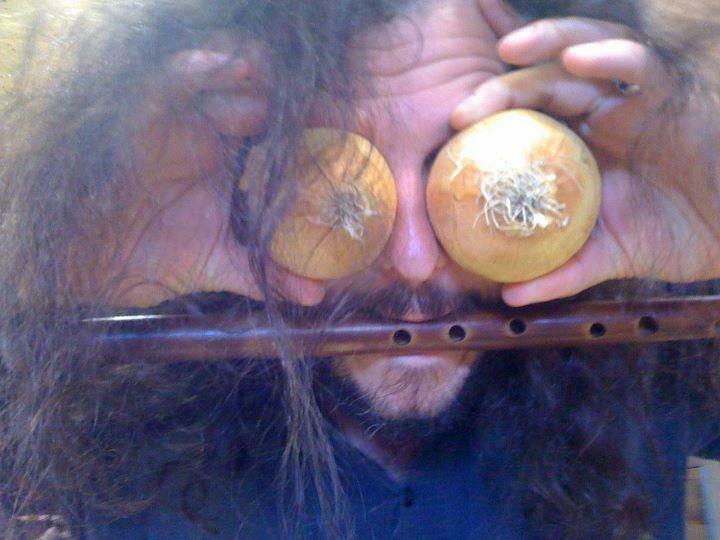 Hayfever is very easy to get rid of. Eat your local honey daily, year-round. Start with very small amounts about a month before pollen season hits where you are, and work your way up to larger amounts, until you no longer react to airborne pollen. You can also take stinging nettle (Urtica species) daily in any form. For hay fever, stinging nettle helps if you start it a few weeks before your hayfever irritant arrives. You can stop taking it when your brand of pollen has left the winds. But nettles are so good for you that they’re great year round. They’re just loaded with minerals. 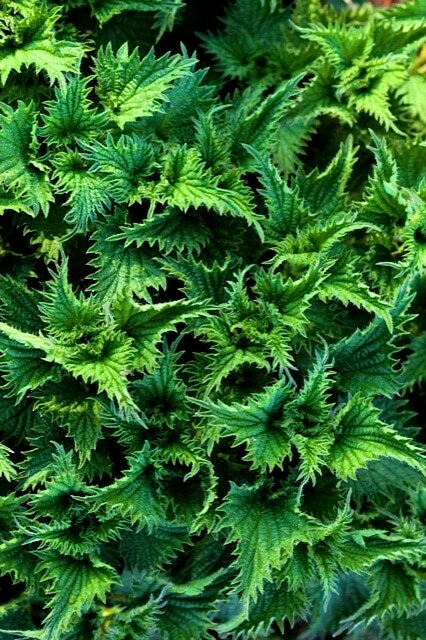 Your hair, nails, mood and connective tissue will thank you for taking nettles daily. If you abhor the taste of nettles, take horsetails (Equisetum) for your hair, nails and connective tissue instead. Don’t take nettles if your hemoglobin is dangerously high. If nettles isn’t abundant where you live, try the flowering tops of goldenrod (Solidago species) instead. Take a tea or tincture whenever you’re all clogged up. 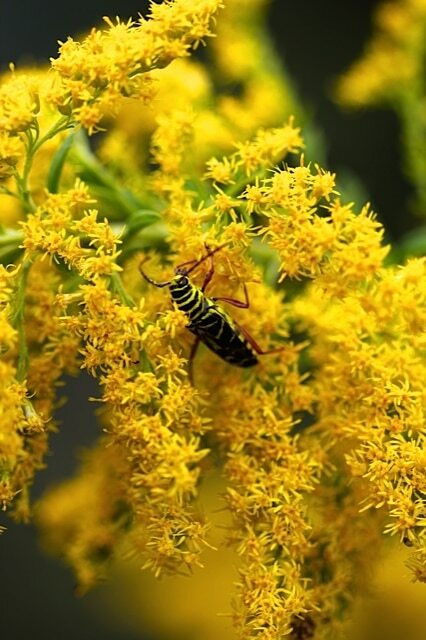 Goldenrod can even stop an asthma attack in its tracks. Luck! Another option is to add a bit of tincture to a straight water and salt saline solution (using the proportions given above). But I like teas best; they really bathe the tissues better. I like making a pot of said tea and freeze the excess as ice cubes. But what should I put in this tea, you ask? On the whole, if a tissue is swollen, inflamed and leaking fluids, it’s telling you it needs an astringent. 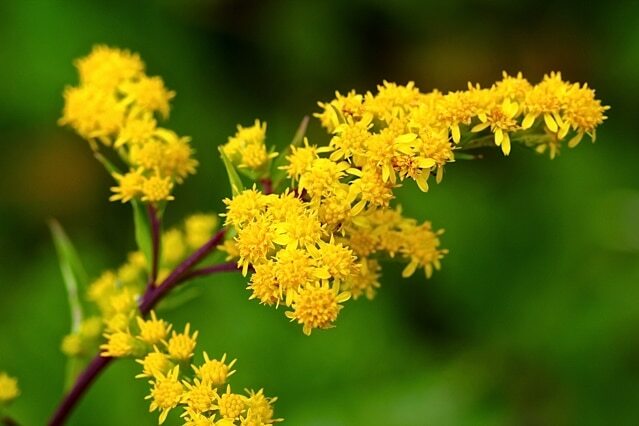 Some of my favorite astringents to use in nasal washes are goldenrod, ox eye daisy and ragweed. 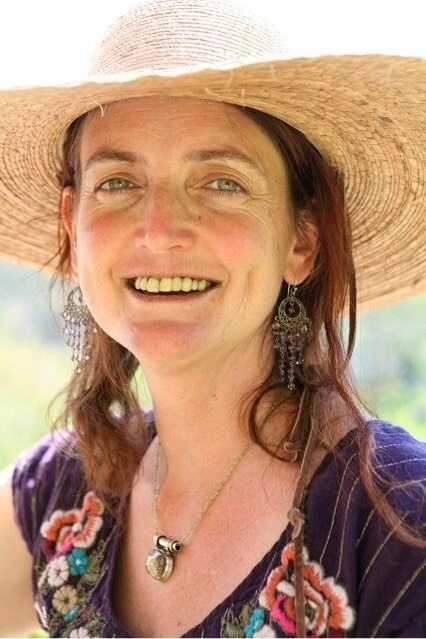 I’ve also used weeping willow tincture added to a saline solution for sinus swelling with intense inflammation and pain. For eyewashes, astringents address swelling, inflammation and mucus discharge. I use very mild astringents: strawberry leaf and purple loosestrife are commonly in my mixes. Yes, eyebright is great here too, but it’s by no means the only or “best” eye herb available to us. Whether for the eyes of nasal cavity, don’t make or use very strongly astringent preparations, as you can overshoot the mark and dry the tissues out too much, This is especially true for eyewashes. Aromatics disperse congestion, are often antimicrobials, and like astringents also act as topical anti-inflammatories. If we look at the list of astringents mentioned above, we’ll see that most of the ones mentioned for nasal washes are both astringent and aromatic (we might also think here about yarrow). That’s no coincidence: congestion and leakage are both common in upper respiratory allergies. An aromatic I’ve used that’s not as strongly astringent is wild bee balm, Monarda fistulosa. It’s quite fiery and should be made as a very mild tea for sinus inflammation and congestion, lest it irritate. I use fewer aromatics for eye issues, as congestion is less of an issue, but chamomile is a spectacular soothing aromatic anti-inflammatory. These herbs help to heal damage to tissues; sometimes I refer to the simply as “tissue healers” (don’t know if you’ve noticed, but vulnerary isn’t a commonly understood word nowadays). 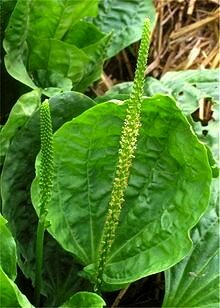 My favorite here, by far, is plantain leaf (broad or narrow). All by itself, it can do tremendous good, and it’s the base of the majority of washes I put together. We can also think of calendula, though I personally don’t use this one as much for eyes and nasal cavities. Comfrey might be considered as well, though I’m less inclined to use it when I have plantain around. If I did, I’d probably just add a smidge and not make it the base of a mix. A combination of an astringent, a demulcent and a vulnerary, with proportions chosen depending on how much swelling and leaking there is (astringents), how much congestion there is (aromatics) and how irritated or perhaps damaged the tissues themselves seem (vulneraries) make up the brunt of my blends. Truthfully, I almost always start out thinking, “what am I gonna add to plantain?” Additionally, and especially for eye issues, I’ll frequently add some demulcent, since a bit of lubrication lessens the irritation cause by blinking. Mallow or sassafras leaf, violet, and purple loosestrife flowers are my most common choices, but you can also use common demulcents like slippery elm and marshmallow, just don’t make the tea so thick and mucilaginous you can pick it up with tongs: you just need a little bit of slimy lubrication. I might also think about herbs possessed of a specifically anti-histamine nature… both eyebright and ragweed come to mind here. 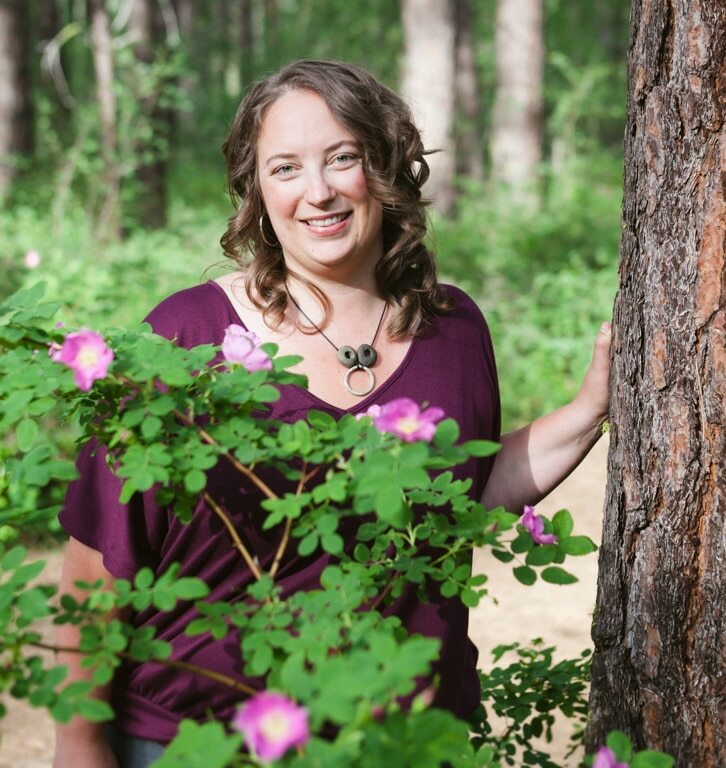 I’ll be teaching extensively about sinus and nasal issues at this year’s Herbal Resurgence Conference in Arizona; come see me! Herbs and dietary modifications can greatly alleviate the symptoms of allergic rhinitis (hay fever), as well as reduce the incidence of secondary sinus infections. Although I typically don’t see allergies completely disappear, quality of life can be substantially improved with herbal therapy. The best results are achieved with long-term tonic support, rather than simply addressing allergies acutely. In my practice, I create two formulas for allergy sufferers: a tonic to be taken daily and an acute remedy for symptomatic relief. The tonic formula needs to be taken for a minimum of three months in order to achieve maximum benefit. The following information is also applicable to the treatment of asthma and eczema, as they are related conditions. Reduce the overall inflammatory state of body by increasing flavonoid-rich foods into the diet. Colorful berries and vegetables, rich in anti-inflammatory compounds, can be eaten daily. Smoothies, berry fruit salad, fruit leather, berry concentrates, and healthy pies, jams, and cobblers are some excellent choices. Quercitin, a type of flavonoid, has been shown to stabilize mast cells (specialized immune cells that produce histamine and other inflammatory compounds in response to an allergen.) Quercitin is found in high concentrations in red onions, capers, kale, dock, watercress and buckwheat. Increase consumption of omega-3 fatty acids. High quality omega-3 fatty acids can help to reduce the production of pro-inflammatory eicosanoids (lipid-based hormone-like molecules). Good choices include: organic grass-fed meat and eggs, and cold-water fish such as wild salmon, trout, sardines and anchovies. You can also choose to supplement with high quality cod liver oil. Eliminate food allergens and irritants. Many people find that food allergies/intolerances exacerbate sinus allergies. The most common culprits are gluten and dairy, but look out for corn and soy as well. Removing mucus-producing dairy during hay fever season often produces dramatic results. Licorice root (Glycyrrhiza glabra, Fabaceae) is an excellent tonic anti-inflammatory, especially for people who run dry. 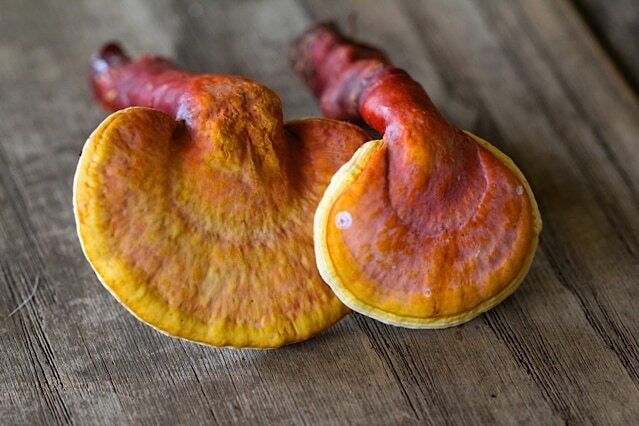 Reishi (Ganoderma tsugae, G. applanatum, and Ganodermataceae) mushroom is another one of my favorite tonic anti-inflammatory remedies. Reishi is also an immunomodulator, and lessens the immune system’s overzealous response to allergens. 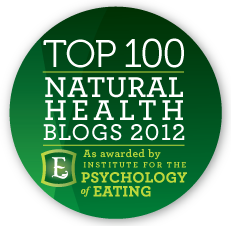 Expect other health improvements – one of the many wonderful things about herbs is unexpected beneficial side effects! Nettles leaf (Urtica dioica, Urticaceae) freeze-dried capsules are the gold standard in tonic allergy relief. Many herbalists use strong nettle infusions or double macerated tinctures in lieu of the capsules. Turmeric (Curcuma longa, Zingiberaceae) is extremely effective both for tonic and acute allergy relief. Turmeric helps to reduce mast cell degranulation, or histamine-release, and thus acts as an herbal anti-histamine. Turmeric can be eaten liberally in food, but to ingest a medicinal portion I typically recommend the tincture, capsules, or mixing the powder with honey and/or nut milk. A sprinkling of black pepper helps to assimilate turmeric more effectively. Herbal allies for allergy relief have the following properties: astringent, anti-catarrhal (lessening mucus), anti-inflammatory, and demulcent. 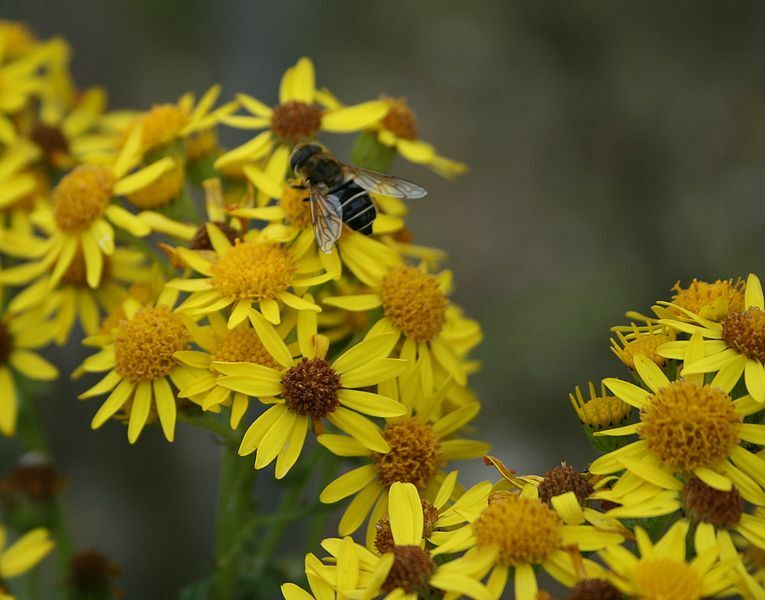 Some of my favorites include elderflower (Sambucus canadensis, Adoxaceae), feverfew (Tanacetum parthenium, Asteraceae), goldenrod (Solidago spp., Asteraceae), ragweed (Ambrosia artemisifolia and A. trifida, Asteraceae) and tickseed (Bidens alba and others, Asteraceae). If the person runs dry, I will add demulcent teas like licorice and slippery elm to help reduce the intense anti-catarrhal actions. Steam inhalations help to clear the sinuses and reduce inflammation, and work to lessen secondary infections through their anti-microbial action. Bring a pot of water to boil and add two drops each of the following essential oils: eucalyptus, peppermint and lavender essential oil. Keep the eyes closed and inhale the steam with a towel over the head. You can also try an herbal version of this aromatic steam inhalation by adding handfuls of thyme (Thymus spp., Lamiaceae) and bergamot (Monarda spp., Lamiaceae) into boiling water. Hay Fever and seasonal allergies can be frustrating to treat for even an experienced practitioner, and certainly a great discomfort to those suffering from rhinitis and the sometimes accompanying secondary infections. While I see many people still trying to use herbs in a “this herb for that disease diagnosis”, allergies are a great illustration of just how poorly this paradigm can work in clinical practice. Instead of simply saying “nettles are good for allergies”, I find it much more effective to look at the underlying constitution and overall pattern of symptoms that are presenting. This article will address one such pattern, and one that tends to be very common. I have used a similar regimen for this general pattern dozens of times with good to great results. I originally learned this pattern from the great Michael Moore, and as for so many things from Michael, I will be eternally grateful for its practicality and overall usefulness in my practice. Keep in mind that you’re not just looking for a single symptom in this case, but for several symptoms that show a correlation to the liver deficiency pattern, and often to an underlying constitutional issue. However, this pattern can be acquired by hepatitis, insulin resistance, and some other chronic health issues. Frequent constipation and/or digestive stagnation, especially if aggravated by stress or tension. The primary herb that I’ll be discussing here is Oregon Grape Root, formerly Mahonia spp., and now placed in the Berberis genus. Oregon Grape Root is an alkaloidal bitter, and cooling, drying, and stimulating in nature, which means that its cold nature can potentially be problematic to the digestive system over a period of time, so I prefer to always formulate it with neutral to warming aromatic herbs to buffer and balance it. 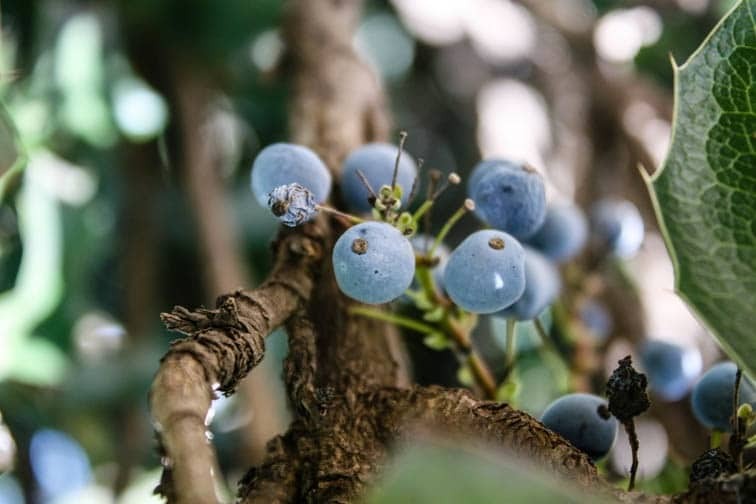 As a note, Oregon Grape Root stimulates liver function through mild irritation, and for this reason, it should be used with caution in folks with significant liver tension in chronic or actue liver disease. 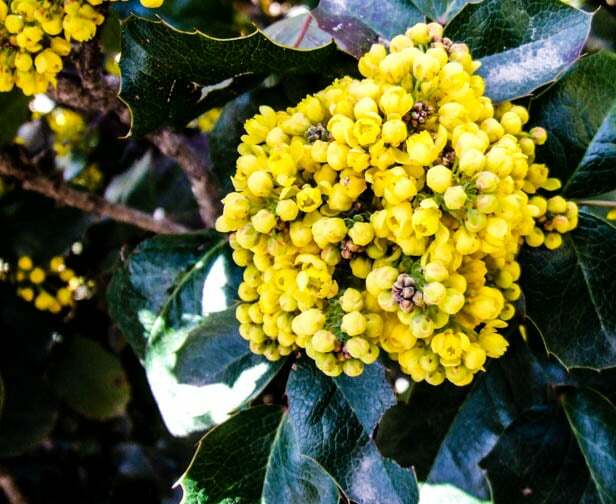 Should ingestion of Oregon Grape Root trigger hepatic pain, hives, or other negative reactions, then it’s time to reassess and consider whether liver relaxants might be more appropriate. 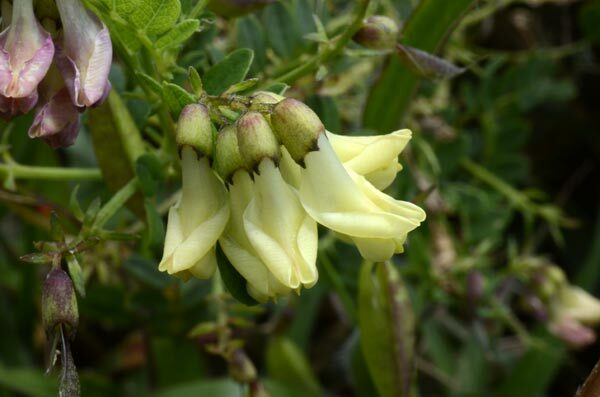 In general, it’s a very safe herb, but as a clinician, I find it very useful to know where a plant is less indicated or sometimes even overtly contra-indicated. I have discussed the physiology of Oregon Grape Root’s effect on the liver, and liver function’s effect on allergies with dozens of herbalists and several MDs at this point, and it’s still somewhat unclear as to exactly why this pattern occurs and why stimulating liver metabolism seems to help, but as with so many herbal therapeutics I do see that it helps even if I don’t always understand why. 1 part Artemisia (I prefer A. ludoviciana, but Artemisia vulgaris and similar species could also work.) aerial parts. 1/2 part Rosemary aerial parts. Dosage: 1/2 – 2 ml, 3-4 times daily, preferably about half an hour before meals. Most of the elements in this formula can be easily switched out for whatever herbs are available, the most important ingredients are the Oregon Grape Root, and at least one warming aromatic herbs. I also very much prefer to include an Artemisia in the formula because of how effectively it tends to remedy liver stagnation, which is frequently a significant part of this pattern. Some people find Oregon Grape Root to be overly stimulating to the Upper G.I., in which case the dosage can be dropped as necessary. What is most necessary here is consistency on a daily basis to assess how well the formula is going to work. It’s important to realize that this sort of treatment takes time to have an effect, and should, ideally, be started several months before hay fever season for best results. Effects on digestion should be perceivable within a week (usually less), but effects on chronic allergies can take several months to be truly noticeable. In individuals where this basic formula has a significant impact, it can continue to reduce the severity of chronic allergies over a period of several years. I suggest accompanying this basic regimen with treatments that will quickly reduce or remove the symptoms, while working on the underlying pattern with this formula and other constitutional adjustments. 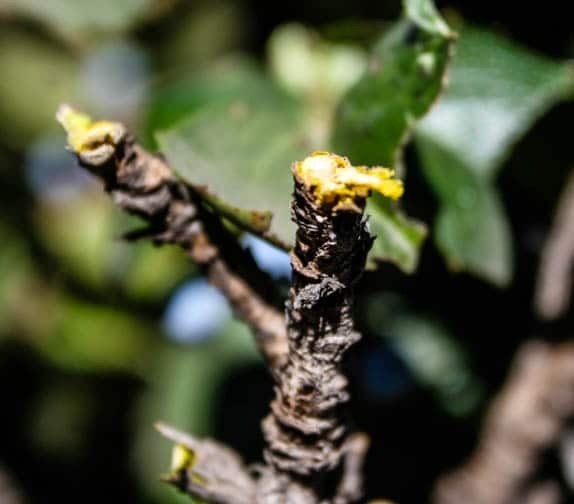 If you purchase your Oregon Grape Root from a commercial source, look for moderate to bright yellow inner bark… the less color present, the less well it will work. Cautions & Contraindications: Some types of hepatitis in some people (look for signs of liver tension for a warning marker), people with a red face and high blood pressure who don’t pee enough. These are dandelion (or burdock maybe) people and they don’t need Oregon Grape Root, it’ll just piss their livers off. Oregon Grape Root effects liver metabolism of many pharmaceuticals, and in most cases should be avoided while on meds to avoid possibly dangerous interactions. Also, exercise caution using this herb for long periods of time in people who are cold and weak. Remember, this is an herb for ~heat~. This also applies to people experiencing heat from deficiency, be gentle and vigilant and it’s usually best to use a balancing formula in these cases. Seasonal allergies are often described as a non-serious health problem, but those people who suffer from hay fever often have a different story to tell! Symptoms of red, itchy watery eyes, sinus headaches, stuffy head, foggy thinking, excessive sneezing and a constantly runny nose can be unbearable. Modern medicine attempts to block the bodyʼs immune system responses in order to stop these symptoms but rarely does it try to address the underlying symptoms of seasonal allergies to help people solve the root cause of the problem and get on with their lives. For years I used to take two different allergy medications year-round in order to avoid sinus congestion and horrible sinus headaches. Once I started addressing the root cause of the allergy symptoms I was able to stop all medications and avoid all those symptoms. If you have seasonal allergies, here are some herbal considerations for addressing the root cause as well as using herbs for acute symptom relief. Seasonal allergies often have a root in an imbalanced immune system. Immunomodulating herbs can support optimal immune system function and are especially suited for people who have seasonal allergies, who are easily fatigued and who frequently get colds and the flu. Some of my favorite immunomodulators include Astragalus (Astragalus membranaceus), Reishi (Ganoderma lucidum) and Cordyceps (Cordyceps sinensis). Reducing your overall systemic inflammation is a powerful way to lessen seasonal allergy symptoms. Avoiding pro-inflammatory foods, including processed foods, common food allergen (gluten, dairy, MSG) and sugar will be a first important step. 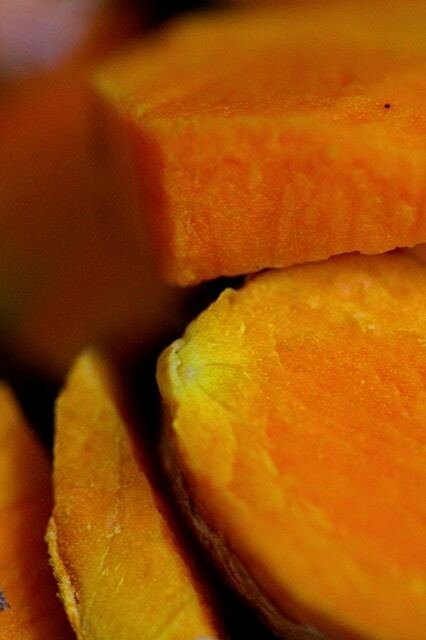 Foods and herbs that are really high in antioxidants will also be crucial. Parsley (Petroselinum crispum), Paprika (Capsicum) and Turmeric (Curcuma longa) are just a few among hundreds to choose from. Have allergies now? Many herbs can be used to give allergy relief. Freeze-dried nettle (Urtica dioica), Goldenrod (Solidago spp.) and ragweed (Ambrosia spp.) can all be used to stop common hay fever symptoms. Dosage becomes very important for the best results. The best way to address seasonal allergies is to assess the person, determine the root cause and then come up with a customized plan. Doing this a month or two before allergy season starts will give the person a chance at avoiding these symptoms. Follow this link to learn more about herbal approaches to seasonal allergies. Liver problems … what kind of liver problems? Milk thistle seed (Silybum marianum) is good for pretty much all of them. Hepatitis, ditto. Oregon grape (Mahonia) isn’t great for that, but dandelion root or leaf (Taraxacum) is. For psoriasis, go _utterly_ gluten- and dairyfree, get out into the sun (and/or take enough vitamin D), and see where the psoriasis lands after a few months of that. Love this article and varied responses! I am curious about the liver deficiency patterns…I think of “dark pink and red” tongue as an excess or heat pattern generally. Thoughts on this? I noticed several authors featured mentioned ragweed to help allergies. Would any use ragweed to alleviate these allergies? That is a very good question about using ragweed, especially for all the people who have a ragweed allergy. I don’t understand how using ragweed would help. Personally, I would think for someone with a ragweed allergy, it could or would make things worse. Will be interested to see the rational behind utilizing it. Thank you so much for posting this article. It was very fascinating to learn that there are so many more herbs out there that I could use for hay fever relief than just the typical “tried and true” herbal remedies. Thank you so much. 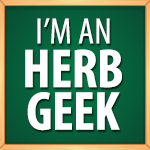 Keep posting about the greatness of herbs! The best way to prevent airborne allergens are nasal filters. They are easy to use and work great. Great article. Thank you about the symptoms of a weak liver which I guess you can have without drinking.